Neutral tones are easy colors to work with in any space, whether it's the living room or the bathroom. They're safe choices that universally appeal to the majority of people who might be hesitant to try a colorful scheme in their homes. However, just because they're considered "safe" doesn't mean that they can't make a statement - it's a matter of how you use these colors in the room. 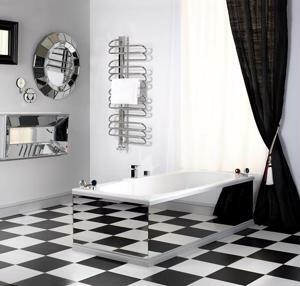 For a cool throwback to the retro culture, opt for alternating black and white tiles for that checkered effect. You can also mimic this look in the shower by using smaller mosaic tiles. Besides this, you can also rock the white and black aesthetic with the bathroom accessories like towels and other decorative pieces. Additionally, a black and white striped pattern in the bathroom can be a bold statement - use this pattern on your window treatments or shower curtain. When it comes to your permanent fixtures, you could go for a black bathroom vanity and make it pop against a white wall for that cool contemporary look.